Having a humidifier to change the quality of the air in your home is nice, but sometimes the price isn’t. 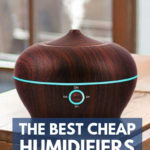 It turns out that there is such thing as affordable humidifiers. You don’t have to lay down $100 to get a great unit. In fact, you can pay under $50 dollars to get a decent and economical humidifier to use in your home, your car, or even when you travel. Many of the budget humidifiers have features you wouldn’t expect for such a small price tag. You’ll have to compromise on some of the other aspects, but you might not mind so much. If all you’re looking for is a personal humidifier that works and costs less than a week’s worth of cold medication, then you’re in the right place. Oh, and there’s an explanation for that cold med reference below! Why Would You Want a Humidifier – Even a Cheap One? What Are Ultrasonic Humidifiers and What Do They Do? Does a Humidifier Help with Stuffy Nose?